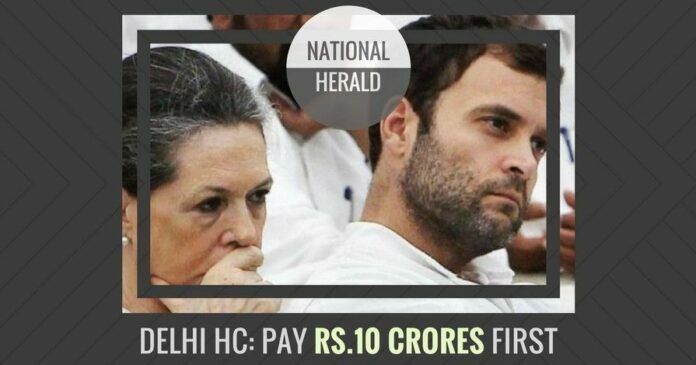 In a big setback to Sonia Gandhi and Rahul Gandhiin the National Herald case, the Delhi High Court (HC) on Monday directed their company Young Indian to deposit Rs.10 crores ($1.67 million) first in their petition against Income Tax (IT) recovery notice of Rs.249.15 crores. The bench of Justices S Ravindra Bhat and A K Chawla directed the company to deposit half the amount with the Income Tax department before March 31 and the remaining Rs.5 crores by April 15th. The IT department has declared that Congress party’s claim of giving Rs.90 crore loans to the newspaper was a total sham and a wrong claim to facilitate Gandhi family-controlled company Young Indian to dubiously take over the ownership of the lands and buildings across India. The High Court said that subject to the deposit of the amount, the tax authorities shall not enforcethe demand of Rs.249.15 crores made on the company for the assessment year 2011-12. The High Court also sought the IT department’s response to Young Indian’s (YI) plea challenging the demand and the proceedings emanating from it and listed the matter for further hearing on April 24. Senior advocate Arvind Datar, appearing for Young Indian, told the court that it will have extreme difficulty in raising Rs.10 crores and sought the amount to be fixed at Rs.7.5 crores. He said that the amount was being collected from contributions by individuals and it would, therefore, be tough to get more money. He also urged the bench to allow the company to deposit the amount in court, saying it was extremely difficult to get a refund from the IT department. Advocate Ashish Jain, representing the IT department, opposed the oral pleas made on YI’s behalf and said the company had to actually deposit Rs.49 crores, 20 percent of the demand, for its appeal to be heard. The bench refused to grant both the pleas made orally on behalf of Young Indian and directed it to deposit Rs.10 crores with the IT department. The High Court also directed the tax authorities to expeditiously hear YI’s appeal against the assessment order. On December 27, 2017, the Income Tax Department’s Assessment Order found that Young Indian had hushed up a taxable income of more than Rs.414 crores ($40 million). While Congress leadership has kept silent on this devastatingIncome Tax Order exposing the frauds in the National Herald case, after some weeks, BJP leader and main petitioner Subramanian Swamy produced a copy of this Income Tax Order in the trial court. Even the advocates representing Sonia and Rahul were unaware of this Income Tax Order. The IT department has declared that Congress party’s claim of giving Rs.90 crore loans to the newspaper was a total sham and a wrong claim to facilitate Gandhi family-controlled company Young Indian to dubiously take over the ownership of the lands and buildings across India. The 105-page Income Tax Assessment Order has declared that Sonia and Rahul Gandhi controlled Young Indian’s actual taxable income is more than Rs.414 crores and canceled the firm’s tax exemption certificate. The Income Tax, in its detailed Assessment Order described the takeover of erstwhile National Herald newspaper publishing company Associated Journals Limited (AJL) by Young Indian as “premeditated scheme of tax evasion”, adventure, fraudulent, involved in hawala nature activities etc. After this order, IT fined and issued a recovery notice for Rs.249.15 crores ($40 million) from Young Indian. The company controlled by Sonia and Rahul with 76 percent shares, has approached the High Court seeking a direction to stay the recovery of the demand of tax and interest of Rs 249.15 crores, raised following a notice of December 27, 2017, issued under section 156 of the I-T Act for the assessment year 2011-12. It has also challenged the order of the IT authorities rejecting the firm’s application and sought a stay on the direction to pay Rs.49.83 crores ($8 million), that is 20 per cent of the total disputed outstanding demand. 1. 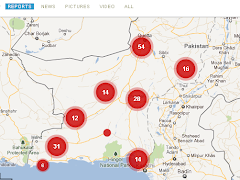 The conversion rate used in this article is 1 USD = 65 Rupees.